The inviting pool at Eau Palm Beach Resort & Spa, which was never crowded during our stay. I swayed gently in the cocoon-like green chair, my feet dangling in the shallow waters of a large rectangular fountain. I felt like I was in my own secret courtyard, alone except for the bright yellow rubber ducks who shared the fountain with me. I was clad only in a lush bathrobe and was enjoying that idyllic, deeply relaxed post-massage state after a massage at Eau Palm Beach Resort & Spa. It was the beginning of a perfect Palm Beach weekend, which included a borderline gluttonous food tour, an intriguing island tour, delicious dining, luxury accommodations and even a bit of consignment shopping. Here are my suggestions on where to stay, what to do and where to eat in Palm Beach, Florida. I dream of recreating this secret courtyard at Eau Palm Beach Resort & Spa in my backyard. Except I don’t have a backyard. But I do have a rubber duck and a bathtub, so that will have to suffice. I’ve stayed at three places in Palm Beach, and enjoyed every one, but my favorite is Eau Palm Beach Resort & Spa, where we spent this last trip. On our prior visit to the property it was a Ritz-Carlton but switched to the Eau in 2013 and was redesigned by Jonathan Adler. Our room was cheerily decorated in blue, yellow and white, my favorite color scheme. The immense lobby is done in more neutral shades, with marble floors that reflect the light of the multiple chandeliers, and several seating areas for guests to lounge comfortably. 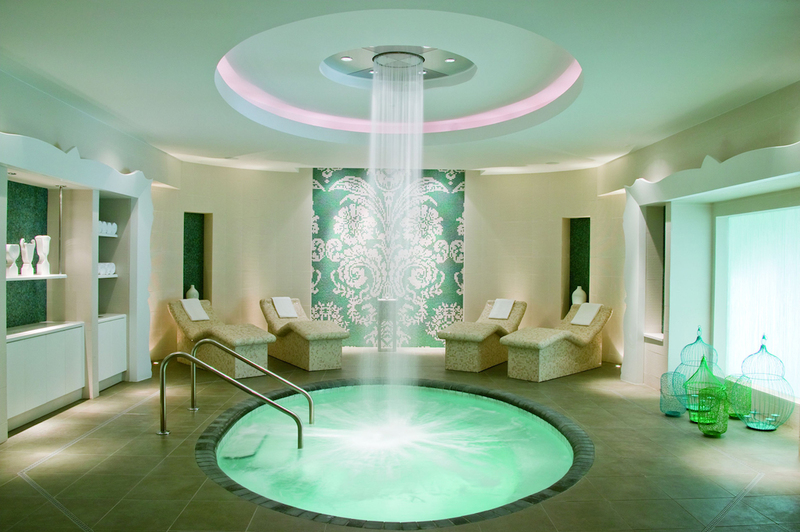 The whirlpool at Eau Palm Beach Resort & Spa features a warm waterfall in the center and heated tile lounge chairs. I circled it several times before I found the button to turn on the jets, but it was worth it for this experience. My husband, Chris, and I started our visit with lunch by the pool at Breeze Ocean Kitchen, where lunch and dinner are served. We dined with the always impeccably dressed Nick Gold, the public relations director of the resort. We’ve known Nick for years as he used to live in Atlanta where he worked as a spokesperson for former Mayor Bill Campbell.I learned later that garden I enjoyed so much after my excellent massage is called The Self-Centered Garden – a name so perfect it made me smile. Nick had told us the focus on the spa was more on well-being than wellness. I know those miniature cupcakes have in the spa certainly contributed to my well-being. As we dined on ceviche and fish tacos under yellow-and-white striped umbrellas with a view of the Atlantic Ocean, we caught up with Nick. He loves living on Palm Beach, where he lives in a condo not far from the resort. After lunch I was off to the 42,000-square-foot Eau Spa, which they refer to as an adult playground. I’m good with that. After checking in and being given a sparkling glass of Champagne, I made a wish in the giant Wishing Well that greets guests right past the check-in area. I learned later that garden I enjoyed so much after my excellent massage is called The Self-Centered Garden – a name so perfect it made me smile. Nick had told us the focus on the spa was more on well-being than wellness. I know those miniature cupcakes have in the spa certainly contributed to my well-being. We found my favorite color scheme in our guest room at Eau Palm Beach Resort and Spa. While I didn’t have much time for lounging by the inviting pools at the resort, I did wander around one morning to enjoy viewing them and took a few photos of the charming mosaics on the walls. If your plans did include a day of wave-watching, private cabanas overlooking the ocean are available for rental, with services and amenities that include a TV, lunch or breakfast, chocolate-covered strawberries and even a bottle of Dom Perignon. My favorite? A margarita cart. Water sports activities are available and can be arranged through a concierge. Of course, the most iconic property on Palm Beach is The Breakers, built by the founder of South Florida himself, Henry Flagler, in 1896, who modeled it after Villa Medici in Rome. With 538 rooms, it’s a large property with a grand tree-lined entrance. This is where the Vanderbilts, Rockefellers, Astors and Carnegies would stay when they weren’t home counting their mounting millions. If you don’t stay here, adding your own name to the long list of illustrious guests, go by for a drink or a meal to tour the property and gaze at the magnificent 200-foot-long lobby. The grand entrance to The Breakers Palm Beach, Florida. We once rode our bicycles up here to attend a wedding. Other accommodations include the must smaller 32-room The Bradley Park Hotel, which is not on the beach, but is a good affordable option with spacious rooms. We stayed here to attend a wedding at The Breakers, when even the special rate for the wedding was a bit pricey for us at the time. When other guests asked if we were staying at The Breakers, we said, “No, we are at The Bradley.” We had rented bikes for the week and cycled down the long entrance to The Breakers where we were met by rather astonished valet parkers who weren’t quite sure what to do with us but pointed over to the side to a spot we could park our bikes. Our first night we dined at Temple Orange in Eau Palm Beach, which focuses on Mediterranean cuisine. The restaurant serves breakfast, lunch and dinner and hosts a pizza night on Thursdays. We started with the massive mezze board, then enjoyed seafood specials. We had a lovely meal, and I always love the ease of taking the elevator up to bed after dinner – no worries about drinking that extra glass of wine. The next night our Uber driver dropped us off, but it took us a few minutes to find Imoto, and I was only sure we were in the right place because I peered in the window and saw matchbook covers with the name on it. This cozy sushi place, which opened last year, is perfect for hanging at the bar and testing some of the freshly prepared and delicious sushi. Go for Happy Hour, Monday through Friday from 5-6PM and enjoy specials on cocktails and small plates. Being big gin fans, we tried the Yuzu Collins, made with gin, yuzu, ginger syrup, shiso and soda. The dinner menu includes shrimp tempura, oysters, sashimi, tuna foie sliders, nigiri, steaks and scallops. Imoto means little sister, with big sister Buccan next door. After a drink or two, we headed there for dinner where we enjoyed both the meal and the lively Palm Beach dining scene. We had the most delicious warm Brussels Sprouts Caesar salad and an amazing Florida Red Snapper Moqueca with coconut porridge and rock shrimp. Chef Clay Conley, a James Beach Award semifinalist, is the founder and owner of both Buccan and Imoto. He also has a third restaurant, Grato, in West Palm Beach. To taste several places at once and explore another area, head over the bridge to West Palm Beach for the West Palm Beach Food Tour, covered in the next section. Here’s an explanation of Palm Beach versus West Palm Beach. Palm Beach: long narrow barrier island with a beach, home to more than 30 billionaires and 87 square miles of highly manicured hedges, some homes have underground tunnels to the beach, median home value is around $1.15 million, president has a home/country club here. West Palm Beach: has no beach, a much larger population, median home value is $277,000, has a neighborhood called Lands of the President. For beach lovers, the answer is obvious. Grab that lotion, beach bag and settle in on the sand. Or lounge around your resort pool. But when you’re ready for a bit more action, there’s plenty to do on Palm Beach. Jamal Lake at Ganache Bakery Café hacked open some coconuts for us while educating us on how to find the juiciest ones. She proved to be so fun and a wealth of knowledge of the area. She told us that off season there are only about 8,000 residents of the area, with that number swelling to 65,000 in season, which for them is October to April. But that pales in comparison to the 7.5 million visitors who went to Palm Beach last year. Our first stop was Johan’s Joe Swedish Coffee House and Cafe where I was introduced to the Swedish custom of fika as we nibbled on chocolate balls and almond horseshoes. Lauren told us the Swedish take breaks for coffee and a treat, chatting with their co-workers for around 15 minutes, then going back to work. It sounds like a lovely custom, although when she told me they do it several times a day and never drink decaf, I wondered why they weren’t a nation of super hyped-up, unproductive fat people. She explained the tour we were taking, telling us it was designed to tell the story of a city and get us off the beaten path. “We picked these restaurants because they tell a part of the story,” she said. I was introduced to the lovely Swedish tradition of fika at Johan’s Joe in West Palm Beach. Apparently the Swedish people take several breaks a day to enjoy a cup of coffee and little treats. No wonder it’s such a happy country. Well, that plus five weeks of vacation, universal healthcare and free higher education. The rest of our tour involved stops at Hullabaloo, Pizza Girls, Pistache French Bistro and Ganache Bakery Café where the owner, Jamal Lake, chopped open fresh coconuts and educated us on how to pick a good one while we sipped tamarind juice. Our last stop was at the intimate bar The Blind Monk where we refreshed ourselves with a delicious Prosecco Mojito (recipe below) and I had my favorite dish, Ahi Tuna Tostada. I loved visiting Clematis Street, especially the section literally on the other side of the tracks. Lauren told us it was a ghost town about 10 years ago but then the CANVAS Outdoor Museum commissioned over 100 murals for the area, adding a lot of value and drawing visitors to the downtown area and helping to revitalize the area. Our tour also took us to Centennial Square, a large park with a popular water fountain, tables and chairs and a view of the Intracoastal Waterway, which Palm Beachers call The Lake. Water sports are available here if you want to take out a kayak or paddleboard. The full name is Palm Beach Post Centennial Square, named after the newspaper that funded the park. The square is the scene of outdoor festivals, movies, a market on Saturdays and during the holidays, a Christmas tree made of sand is lit up every night. The company has added a second tour, the Dixie Dining Corridor Food Tour. If time allows, I’d suggest going on both of them. While time didn’t allow us the opportunity to explore, West Palm Beach also has CityPlace, an upscale center for shopping, dining and entertainment. Inside the former Macy’s at CityPlace you’ll find Culture Lab, a cultural arts center with rotating exhibitions. Grandview Public Market, which bills itself as an “epicurial playground,” has 12 vendors and is open daily for breakfast, lunch and dinner. At night you’ll find entertainment like salsa dancing every Thursday, a live DJ on Friday and Saturday nights and live jazz on Sundays. Another top recommendation is to take an Island Living Tour of Palm Beach with Leslie Diver. Our hope was to do the bike tour. On a previous trip, we’d rented bikes and toured the entire island – an easy thing to do when the terrain is so flat. We even got kicked out of one of the fancy country clubs. We didn’t stay long, mostly because we would be run down by a gaggle of golf carts. But besides that unfortunate detour, Palm Beach is a wonderfully bikeable town. Anyway, afternoon showers typical of South Florida meant we took a driving tour instead, and we were able to cover more territory as Leslie, a former stockbroker turned tour guide, regaled us with stories of the mega-rich who call the island home and the history of the island. We started on foot at the Flagler Museum, housed in a former home called Whitehall where Henry Flagler lived. While we didn’t have time to tour the home, Leslie told us stories of the colorful history of the Flagler family, which included family estrangement, great wealth and suggestions of murder – ah, the lifestyles of the rich and dysfunctional. When I remarked on the prevalence of hedges in front of the homes, she told us there were ordinances against tall walls, but hedges could go as high as the homeowners wanted so they were a good way to ensure privacy. In fact, there is an Instagram account devoted to the hedges of Palm Beach. Many of the mansions in Palm Beach are hidden behind huge rows of hedges. The height of fences is regulated while your hedges can be any height. At times it felt like we were traveling down dark green tunnels, each hedge neatly clipped. Let’s talk about real estate in Palm Beach for a minute. The largest property owner is apparently Ken Griffin, a billionaire from Chicago, who owns 17 acres, and has spent more than $250 million assembling property on the island. A recent search on homes for sale shows the highest price at a whopping $61,500,000. If you’re into real estate, just take a look at more 8-figure homes for sale. The photos are stunning, and you may pick up a few decorating tips while you’re at it. You may even come up with a new way to display your Picassos and Kandinskys. Anyway, all of these gorgeous homes make for a fun home tour and Leslie is an informative guide. We made a few stops and got out to stroll down Worth Avenue, where all the gazillionaires frequent the uber high-end shops. If you’re looking to add to your art or Chanel bag collection, here’s the place to shop. Be sure to duck down into some of the charming, flower-filled courtyards. Another one of my favorite activities in Palm Beach is shopping in thrift and consignment stores. Think about it a minute – these 1 percenters go out, a lot, and they can’t be seen wearing the same outfit to their many social events. So some of their older items are donated or consigned. When we stayed at The Bradley we accidentally stumbled upon a row of consignment and thrift shops on Sunset Avenue and spent a bit of time there. While we didn’t realize it from the outside, one of them was a Good Will – the best Good Will I’ve ever been to. My husband had forgotten a belt, and he found a belt and I snapped up pearl earrings and some highly discounted Louis Vuitton bags. Sadly, when we returned this year, a few of the shops had been bulldozed down and the Good Will was half its previous size. My husband still found several items and I found a few tops, but no deals like previously. Part of that is the nature of thrift shopping, however, and I’d return to check it out again. Another shop that was recommended to us was The Church Mouse and I’d also check out Classic Collections of Palm Beach, which also has men’s clothes. One of the courtyard areas off Worth Avenue in Palm Beach. A new feature of West Palm Beach is the new Brightline express trains, which travel to Miami and Fort Lauderdale several times a day. If you have an extra day, go check out these beautiful upscale trains and take a short ride for the experience. Palm Beach is a perfect getaway for a weekend or longer, with such a variety of things to do, from gawking at billionaires’ homes to lounging on the beach or checking out the restaurants and activities in West Palm Beach.